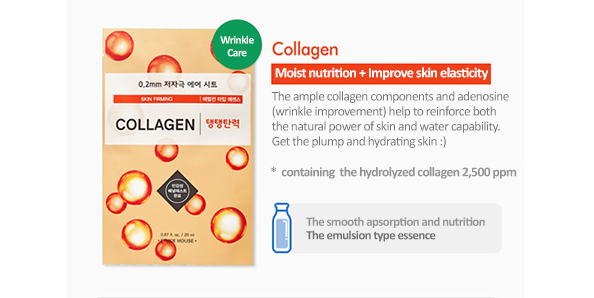 I have always felt that collagen is good for the skin from inside and out. That's why I take my collagen medication once a day. Although I can't really see a difference, I think it is good for my body for various reasons. Let's move it aside, and let's talk about this mask. I want to use the masks and see a difference between what kind of masks that is good for my skin and which ones are meh to me. I already have put up my Innisfree it's real squeeze masks comparison review and I also want to do with other line up of masks in the future. I have quite a bit of masks that I want to use up so, I'm using the masks everyday just to use them up (haha). So, as usual, this Etude House 0.2mm therapy air mask line got 19 flavours of masks and they are all different for different skin needs. 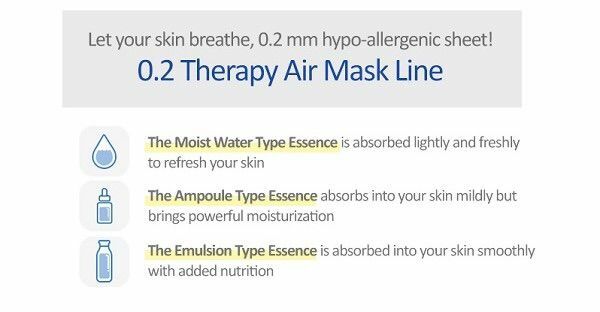 Their essence is differentiated into 3 types namely the moist water type essence which is the thinnest and the most watery essence, the ampoule type essence that I have not use yet and the emulsion type essence which is the thickest and has milky texture of them all and the most moisturising to the skin. Also, with the essence type, the texture of the mask material is also different with accordance to the essence type. The collagen mask is claimed to be firming with collagen components and makes the skin moisturised and plump. The mask is the emulsion type essence that will firm the skin and moisturise the skin from within. 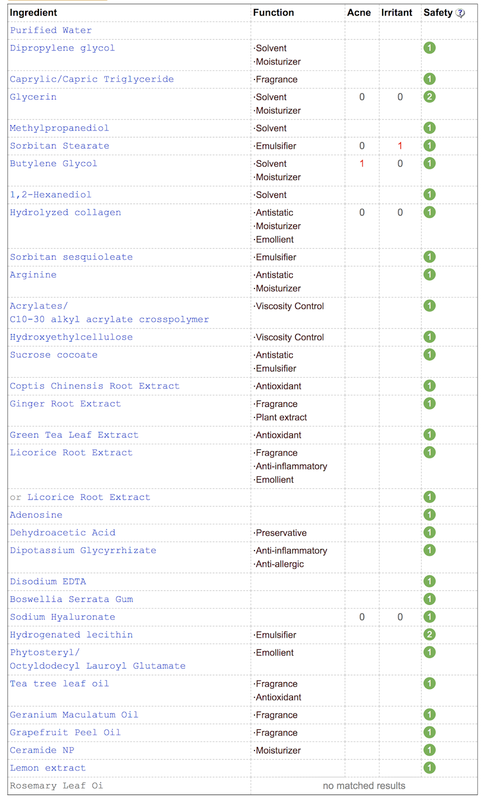 Here's the screen grab from COSDNA with the ingredient list. It has a lot of moisturising ingredients that is good for the skin and has a clean ingredient list. I won't go through in details since I have no idea whether each ingredient is good for the skin or not and I'm still learning about the ingredients. The mask material has a thick texture and is a bit corse than some of the other masks. The good thing about the thick material is that they are not easy to tear at all. It is easy to unfold and apply on the face. The mask is soaked in the essence but since the essence is a thick essence type, it is not dripping. So, you can apply on the plane or anywhere you'd like haha. The fit is nice and fitted to my face. I love the fact that the mouth hole cuts are nice and small but I wished their entire face mask is a bit bigger for my giant face. There is very feint scent but it's not intruding at all while masking. The essence is nice and milky has a thick consistency. There is 20ml of essence inside the packet and it is soaked to the mask. Although there is 20ml of essence inside but there is no leftover essence inside the packet at all. They recommend me to leave the mask on for 10-20 minutes. So, as usual, I left it on for 20 minutes and I was surprised to see that the mask is not as easy as the other ones that I have used before. I was impressed. Although the forehead area is a bit dry but most of the areas are still soaked when I took it off at 20 minutes. I applied the left over mask to my neck for 5 minutes with the leftover moisture. Overall, I am surprised that this is the first mask from the line that I like. After using the mask, although I didn't feel the firming effect but I felt my skin is very smooth, moisturised and clear. Although it's a bit sticky since the essence the emulsion type and it is quite difficult to completely soaked into the skin. All in all, I'm impressed. I'm giving this mask 4 stars out of 5. I don't mind using again if I don't have anything else to try (which is quite difficult since I have a lot of masks that I need to go through!) but it's a good one. I got the entire line of mask during the sale for 50% off and I got all 19 types of masks. Excited to try them all and review them all!